Successfully Added HG 2.4G Auto Balance RC Stunt Robot - Four Characteristics, Load Bearing, Dancing and Singing, Smart Gesture Sensors, Fight Mode to your Shopping Cart. Looking for a fun and creative toy that is guaranteed to bring hours of joy? – Then search no further. The HG 2.4G Auto Balance RC Stunt Robot is the perfect toys for boys or children of any age. 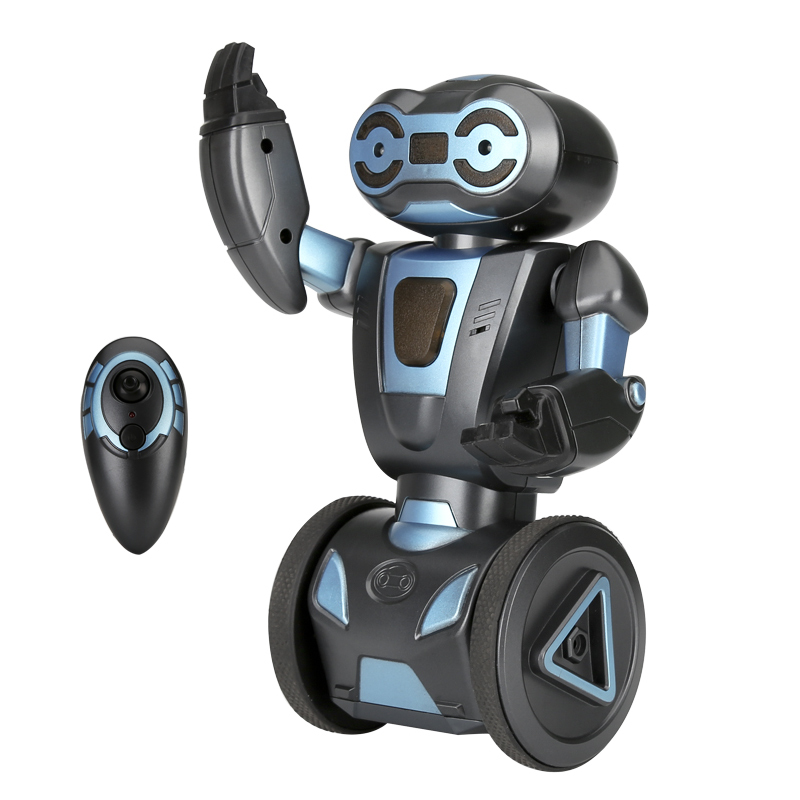 With its futuristic looks the HG 2.4G is a very special robot friend that has it all! This self-balancing robot toy comes with five different characteristics and can do more than simply "walk around" your living room. Thanks to its exceptional balance and load bearing function the HG 2.4G Stunt Robot is capable of carrying small objects. Why not serve the drinks and snacks on your child’s next birthday party with the help of this remarkable butler? The HG 2.4G Auto Balance RC Stunt Robot is guaranteed to put a smile on children’s faces and leave them with an extraordinary and fun memory. When its dancing mode is activated this robot sings and dances along with all your favorite songs. No longer you’ll have to listen your tracks alone as now your robot pet is here to share the fun with you. Equipped with smart hand and gesture sensors this RC Robot can furthermore be programmed to follow the movement of your hands. Simply hold your hand in front of its sensor and the robot will follow your every move. In addition its fighting mode allows this fighting robot to move around rapidly and punch different objects or similar robots, allowing you to reconstruct your own miniature robot battles in the comfort of your living room. The auto balancing robot is light in weight and easy to command with the included remote control. Switching between either of the above-mentioned characteristics has never been easier as a simple click of a button on the remote control will do the trick. Its built-in color light indicates the mood which is currently applied by showing either a purple light when applying its load-bearing function, green light for its dancing robot mode, blue light for gesture mode, or red light when its attack function is activated. With its friendly and futuristic looks this little robot toy is the perfect companion that is guaranteed to bring hours of joy and laughter to your children and all their friends. Easy to operate and safe to play with, this remarkable little pet is a splendid gift for boys and girls of any age. This RC Robot Pet comes with a 12 months warranty, brought to you by the leader in electronic devices as well as wholesale electronic gadgets..
Arabic: - لعبة روبوت حيلة اتفاقية روتردام - Chinese Simplified: - 遥控特技机器人玩具 - Czech: - RC Stunt Robot hračka - Dutch: - RC Stunt Robot speelgoed - French: - Jouet Robot RC Stunt - German: - RC Stunt Roboter Spielzeug - Hebrew: - RC תעלול רובוט צעצוע - Hindi: - RC स्टंट रोबोट खिलौना - Hungarian: - RC Stunt Robot játék - Italian: - Robot giocattolo RC Stunt - Japanese: - RC スタント ロボット玩具 - Korean: - 스턴 트 RC 로봇 장난감 - Malay: - Lagak ngeri RC Robot mainan - Norwegian Bokmål: - RC Stunt Robot leketøy - Romanian: - Jucărie de Robot RC Stunt - Russian: - Игрушка робот RC трюк - Spanish: - RC Stunt Robot juguete - Thai: - ผาดโผน RC ของเล่นหุ่นยนต์ - Turkish: - RC dublör Robot oyuncak - Vietnamese: - RC Stunt Robot đồ chơi. I love these Robots they are fun and easy to use. I lost my table at the Friday fest this Friday but will order them for the Next Month Friday Fest.